I am so excited about this new line of stamps from Penny Black. First, I used my Marvey Water Color Markers to color the stamp, changing the shade slightly on each one. Then I cut each flower out . Before attaching the flowers, I attached the DP to a 6x6 card stock, knowing I wasn't go to run a ribbon, etc under it. Zip Dry Glue was then used to adhere each flower and stem on to the DP. I added a dab of Flower Soft Glue on to the middle of each flower and then I sprinkled it with the Sunshine Yellow Flower soft. Wow, what a difference that makes, giving the flowers some dimension and life like appearance. I stamped the Verve Verse that I just received and cut and embossed it with the Spellbinders Label 4 die. A beautiful silk bow from Sharon Johnson was tied using the Bow Easy and attached with a glue dot. Please check out the catagories on your left under "Things in My Store"
Joan your card is gorgeous! 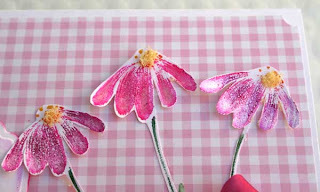 Love your ribbon, so beautiful and the stamps are fabulous! 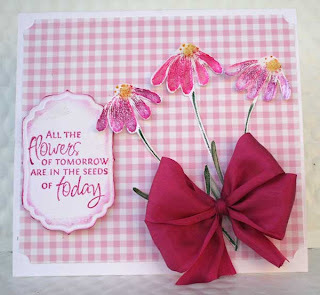 Joan, what a gorgeous card - that stamp is so pretty and I love your beautiful silk bow!!! GREAT work!! !